Flormar L34: I purchased this lipstick over in Fuerteventura almost a year ago. This was before Flormar was available in Ireland. I picked up a few shades just to try them out as they were on offer for something small like €3. I picked up L34 ( I'm not sure if it now has a proper name now or not). It is a gorgeous vibrant purple and is absolutely perfect for Spring Summer time. The pigmentation is crazy good! And it lasts hours without needing to retouch it. It applies very easily and feels super creamy on the lips but has a matte finish which is a little different. Flormar L33: Again I picked this up in Fuerteventura last year. I really love this lipstick, it's a gorgeous pastel purple. Similar to L34 it applies very smoothly. It does need a few layers to really build up the colour as my lips are naturally quite dark and obviously the lipstick is a light pastel purple. It does feel a little bit more drying than L34 but it's not uncomfortable to wear. I just really like the look of the lipstick and it's one of my absolute favourites! Velvet Vamp: This is a liquid lipstick from Makeup Revolution. 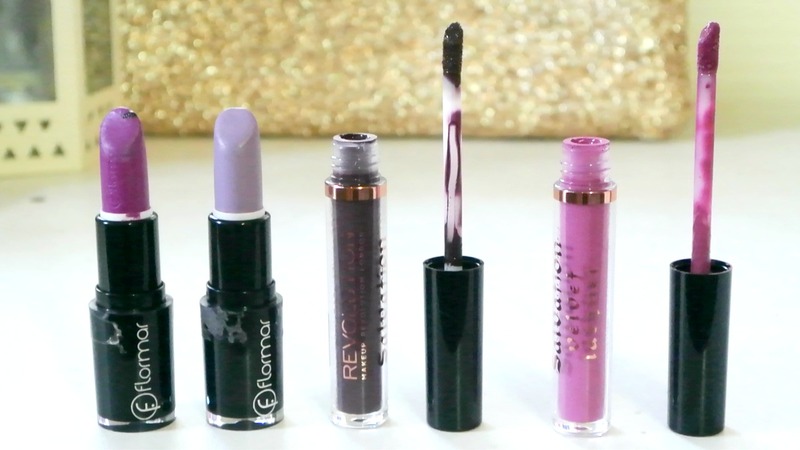 I find Makeup Revolution to be a hit and miss brand, but their lipsticks are definitely a hit. One of my all time favourites lipsticks used to be Wet N Wild Vamp it up, I loved how dark it was. The only problem with it was that it wore off terribly. For the first hour it was gorgeous but the second it started to wear away, it looked awful. When I seen velvet vamp on the MUR website I thought, maybe just maybe, because it's a liquid lipstick it might have better staying power. When it arrived I knew straight away that it was a winner. The formulation is a million times better. It has a matte finish but wears away really well because it leaves behind a stain. Once applied it doesn't budge for a few hours! It looks black in the picture above, but it's not it's just a really deep plum purple. This is probably my favourite lipstick of all time! Keep Lying For You: I bought this alongside Velvet Vamp from the MUR website. This is a great liquid lipstick, just like Velvet Vamp it applies really well. The applicator is very sturdy but kind of moves with your lips, so you can't really mess up when applying it. They staying power is just incredible and it is SERIOUSLY pigmented!!! It wears away really well and is just an absolute gem considering the price! I think I paid £1.25 for it, absolute bargain! What is your favourite purple Lipstick ? 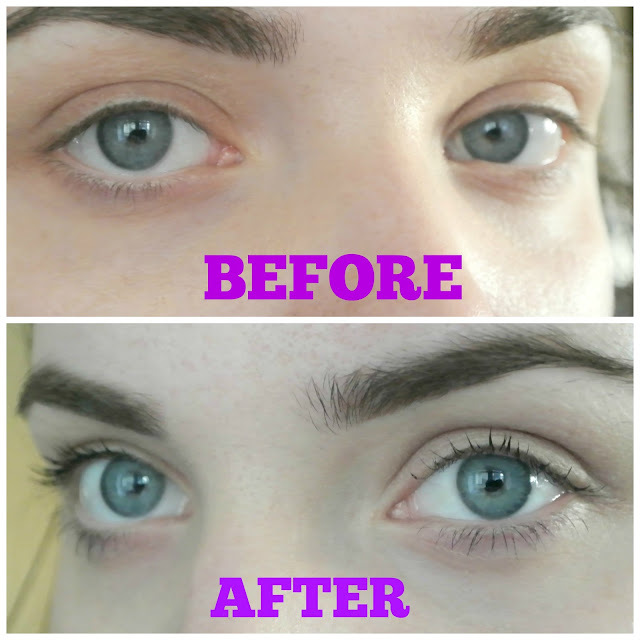 I'm back with a mascara review! 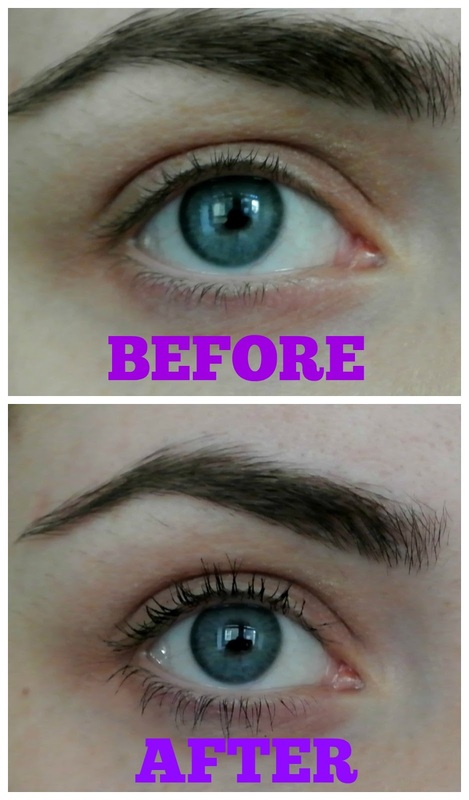 I love reviewing mascaras and seeing the before and after pictures. Today I'm reviewing the P.S...Mascara, this is of course Pennys own brand. I'm going to try and keep this post short and sweet so...let's get straight in! I'll start with the positives, I really like the packaging. It looks a lot more expensive than €1.50. I really like thelook of the black and gold packaging. I also like the shape, especially the pointed top. As for the brush I do actually like it. It's quite thick as you can see from the picture above. 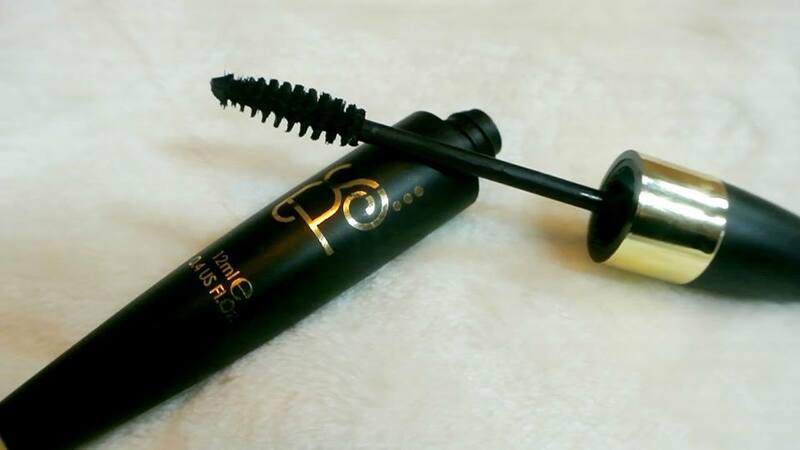 It does get all around your lashes and give them a decent bit of volume. For me that's where the positives end. I curled my lashes as I always do because I have quite straight lashes and it didn't hold the curl at all. After about 30 minutes they were back to being straight. The consistency of the mascara itself was very thick and quite dry. I feel as though this mascara is more of a lash tint than anything else. After about 6-7 hours you really wouldn't notice it on my lashes. I was very underwhelmed when using it. For €1.50 I can't really complain but I wouldn't buy it again and I certainly wouldn't recommend it. I find the PS range to be very hit and miss and while there are so absolute gems, like the lip liners etc there are definitely some misses and for me this mascara is definitely one of them! Have you tried this mascara? What did you think ? Social Media : There has been a negative undercurrent going on recently in regards to blogging and particularly beauty blogging. I've voiced my opinion on it over on snapchat and I don't want to waste my energy on it again to be honest. However it did have a big effect on me. I found myself nervous to write reviews even though I wasn't being paid or hadn't been sent something to review. But still i was nervous and this made me want to take a break from blogging, but I never intended for it to be this long. Another thing is that snapchat has taken over my life! It's 100% the social media platform that I'm most active on. I love the realness of it and how easy it is to connect with people. But it does take up a lot of time as does Instagram, Facebook, twitter etc.and I have been keeping up with videos on YouTube. It's just all been a bit busy. College: This is the main reason why I haven't been blogging. As a lot of you will know I am currently in college studying Digital Media Design. I love the course and I get to do some really cool modules and assignments. But this semester all of my modules are continuous assessment, meaning that instead of having final exams at the end of the semester I have small assignments that are graded the whole way through the semester. I actually really do like the fact that it's continuous assessment, but it is very difficult. I am constantly inundated with work that HAS to be done within a few days. I never really have a day or night 'off' because there is always work to be done. Along with that as I'm doing media course, it's not as simple as doing an essay and then you're finished, it's mostly portfolio work. This means we are given a brief and a deadline and you have to get as much work done as possible in this time. This leaves very little room for blogging. 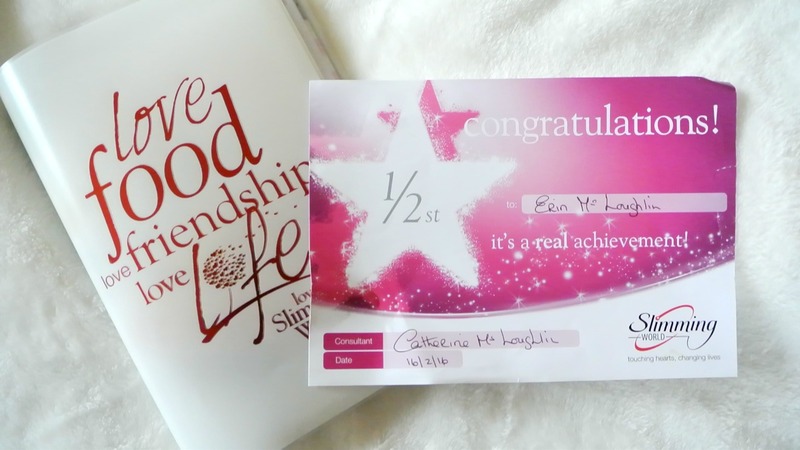 Slimming World: I don't think I've mentioned this anywhere else but mid January I actually joined Slimming World. If you've followed the blog for a long time, you'll know I've been wanting to lose weight for quite a while. I'm not massive and I know that but I still have a few stone that I'd like to lose. So I started back in January and in the course of about 5-6 weeks I'd lost 7lbs just in time for James' brother's wedding too. I was delighted as I hadn't really stuck to plan at all, often having 1 or 2 takeaways a week or having WAY too much chocolate. The most difficult thing was figuring out how the system worked and preparing meals, this took a lot of time especially in the first few weeks. I haven't been doing slimming world for maybe 3 weeks now and I have definitely gained some of it back on, again college took over my life and I didn't take time out to prepare meals etc. But as of this week I'm back on track! The reason I kept it to myself was simply because I wasn't sure if I was going to stick to it or even like the plan so I didn't want to set myself up for failure or add any extra pressure on myself. Work Placement: As part of my course and many others in the University of Limerick, it is mandatory to do 9 months work placement during your degree. Mine will be from June 2016 to January 2017. UL have a system that help all students find work placement but there is an option to set it up yourself. I chose this option and hopefully I'll be able to work with my mam for my placement. My mam has set up a business (which I will discuss in more detail later on in the year) and I just cannot wait to start working with her. Obviously setting all of that up and filling out loads of forms etc has taking up a lot of time but I can't wait. 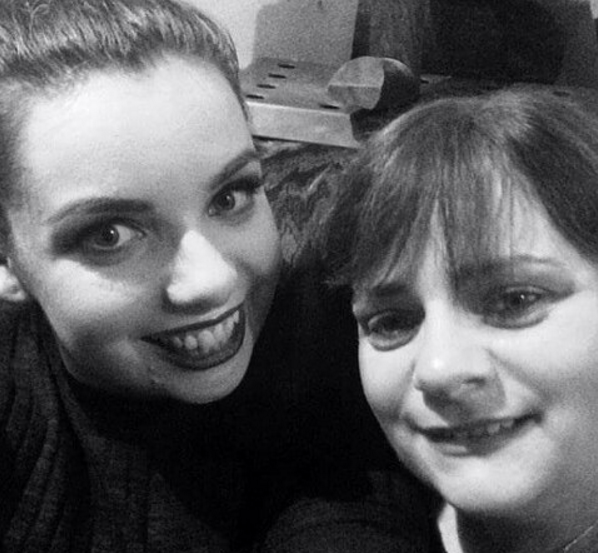 Myself and my mam are very similar people so I think it'll be an amazing experience also she's my best friend and I'll get to live at home again so that's exciting. Friends: One of my new years resolutions was to see my friends more. Last year I worked myself to bone and left very little time for my friends, which was ok because they were all busy with their lives too. However as I get older and the more people I meet, the more I appreciate and love my best friends. They are all absolute stars and I just love them. So it would be silly to not want to spend more time for them. I'm making much more of an effort this semester and I have to say, it's done me the world of good. 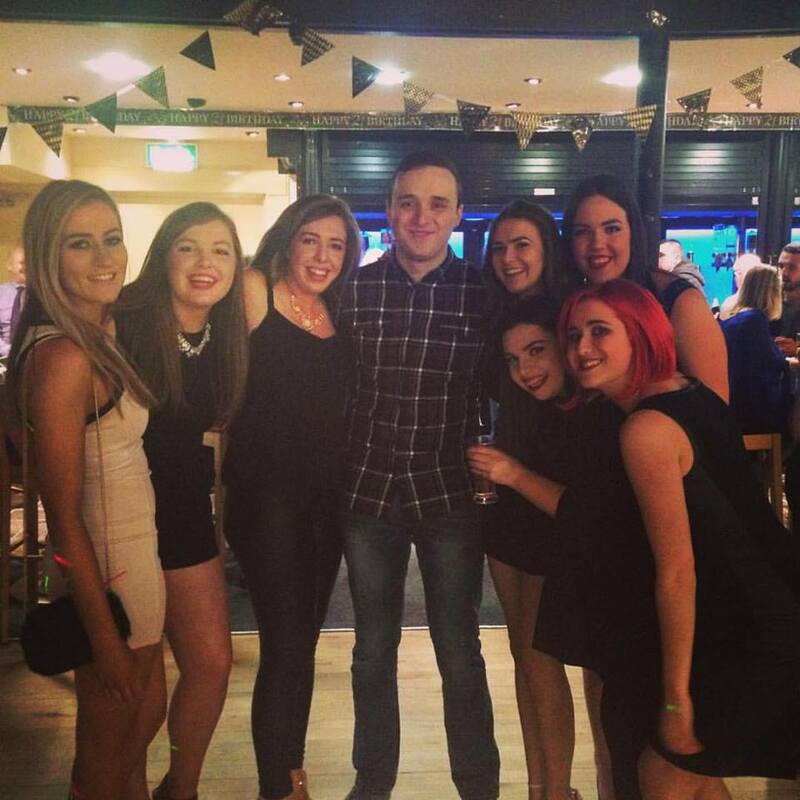 I love going out to one of the girl's houses after college and having a good catch up about everything and essentially having a bit of free therapy. So I've enjoyed taking mornings/afternoons and evenings off to make the time to see them. All things combined I've just been busy! I do think it was healthy for me to take a break and while I'm in college, my degree is my number one priority. I have things a little more under control now and I'm very excited for the rest of 2016. 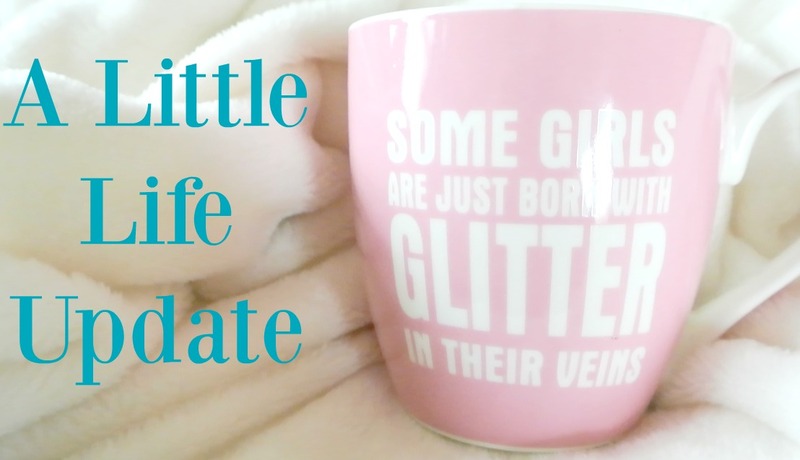 I'm so happy to be back blogging again!